ST. CHARLES, Mo. 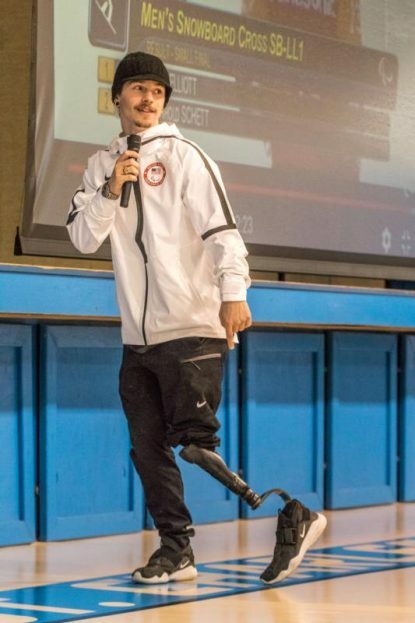 (CNS) — Near the end of Noah Elliott’s presentation at St. Charles Borromeo School, a video played of his charge down a mountain in the snowboard cross event at the 2018 Paralympic Winter Games. “Oh, that’s me!” the self-described “bionic man” shouted as he moved out from the side of the screen and pointed at the helmeted figure at the top of a mountain at the competition venue in PyeongChang, South Korea. Elliott then chanted “USA, USA,” and applause rang out from the students at the Catholic school in St. Charles, his hometown. Elliott recalled the end of the run when he realized he had won the first of his two medals. “I saw my dream a few years before, and I was realizing it,” he said, referring to the time four years earlier, at 16, when he watched the Paralympic Winter Games on TV from a hospital room in St. Louis, where he lived for most of a 10-month stretch. He had been undergoing treatment, including chemotherapy, for osteosarcoma, the most common type of bone cancer found in children and teens. It led first to a total knee replacement and the insertion of a titanium rod in place of his tibia. Then, on Jan. 30, 2015, his leg was amputated above his knee after an infection. Six months later, he tried snowboarding for the first time on a new prosthesis. He began training in earnest a year before the Paralympic Games, competing for the first time in New Zealand. 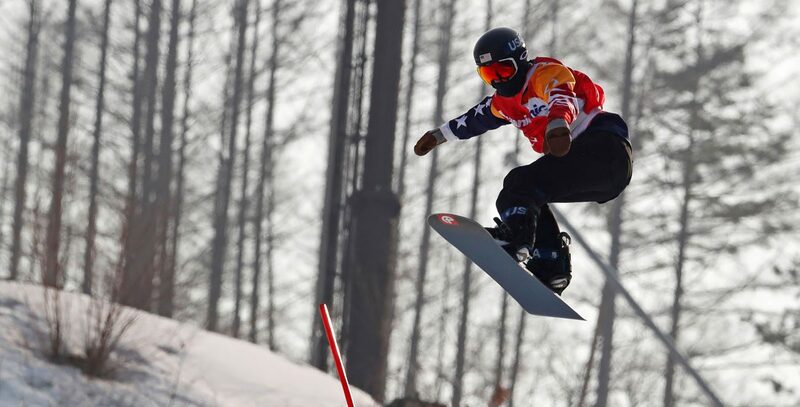 He has never lost in banked slalom, the event in which he won a gold medal. He also won a bronze medal in snowboard cross. The 20-year-old athlete’s father, Buddy Ell, is a member of St. Charles Borromeo Parish. Elliott and his father visited the church before and after his leg was amputated. “It helped a lot with our healing and another way for us to bond and connect on a spiritual level,” said Elliott, who once aspired to be a professional skateboarder. Elliott said he felt the support and had the spiritual awareness that enabled him to “realize there is a life past that day of treatment or amputation.” It helped him to see possibilities, and he promised to help others after he made it through his struggles. It’s fun for Elliott to present a message of optimism and perseverance – “seeing the glass as half full rather than half empty” — while inspiring others to pursue their passion. He thanks people who encouraged him or made contributions that helped pay for his training in Utah. Included was one of the students at St. Charles Borromeo School who told a teacher that he gave $2 at a fundraiser for Elliott. He recently accompanied Olympic and Paralympic Team USA athletes in a visit to the White House, meeting with President Donald Trump. He met some of the other athletes earlier while awaiting and aboard a flight from San Francisco to South Korea and in the opening ceremonies. To make the U.S. team, an athlete must be dedicated to his or her sport and follow a strict training schedule, Elliott said. He spent almost all of his time leading to the Paralympics practicing in the snow or working out in a gym. In the summer, he trains hard as well, mountain biking and running, although he occasionally will sneak away to go fishing. Father William Dotson, parish administrator, said it’s good for the students to see someone who overcame a difficulty in life and made the best of it. Kenny is a staff writer at the St. Louis Review and Catholic St. Louis, publications of the Archdiocese of St. Louis.